Today we find ourselves in a new age of discovery, a Renaissance of the European martial arts. Old myths and outdated beliefs are being challenged by new scientific knowledge brought about by the rediscovery of old texts. 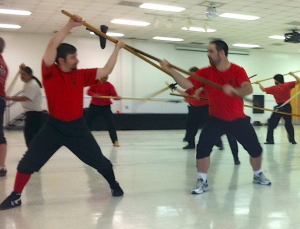 Due to the rediscovery in recent years of forgotten, lost, or previously unknown European works concerned with self defense and the handling of arms –particularly swordsmanship– we students of the subject find ourselves in a period of rebirth. Like the caravel ships that took explorers across the oceans, we now have our computers that sail the Internet, opening routes of communication and trade to bring together a vast community of practitioners, amateur researchers, and historians questioning the outdated assumptions of traditional fencing and who are eager to relearn and bring to back to life our lost martial heritage. The ARMA system of exploring real techniques places emphasis on proper intent –i.e., learning and executing moves with realistic speed and range in order to acquire a correct sense of counter-timing, balance, and motion. ARMA stresses a “martial” approach to this subject – by this we mean emphasizing that these skills and techniques were intended to be used with force to cause injury –even though we never use them for this. To be relearned properly today, it is only logical that they must –must – be performed in earnest, with energy and speed, and we must make the effort to practice them in this way. This doesn’t come easily at first and has to be developed over time. The degree to which each student achieves it may vary. Thus, one of the things we try to inspire in modern students is a realistic appreciation of the martial content of the subject we study. We therefore place value on the mental or psychological aspects as well as the physical or technical. We provide a system of Armatura (drills & exercises) that enable the student to make quick progress and to teach themselves. As with the practice of popular forms of Asian martial-arts, there are noticeably different approaches to the study and practice of historical Western fighting arts emerging today. You can choose between a “hard” or “soft” style of Karate, or an “external” or “internal” style of Kung Fu, and note fundamentally different attitudes between a Tae Kwon Do class and a Jujitsu class, or between Aikido and Tai Chi as opposed to Tai Boxing and Jeet Kune Do. A student finds one that fits their needs and their interests and their attitude. So it is with Medieval and Renaissance weapon study to a large degree now. With regard to studying and practicing historical European methods, there are those who focus merely on stage displays and performance, those who play fantasy games, those who focus on tournaments and competitions, those who reenact the later Code Duello or aspects of some particular master’s Schoole of Defence, and those who might do a little of everything. The martial spirit and intensity found in their training varies depending upon the goals, attitudes, knowledge, and methods of the participants involved. When it comes to the ARMA, and the Houston Study Group in particular, although we resist the use of the phrase we could nonetheless be described as one of the “hard, external styles.” Our effort is focused on late Medieval and Renaissance swords and weapons. 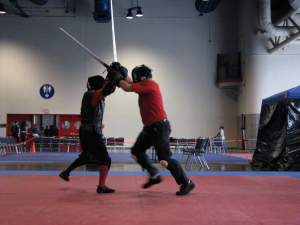 We emphasize contact-sparring, drilling with wooden wasters and steel blunts, training with replica weapons, grappling & closing techniques, research, scholarship, unarmored combat, and test-cutting with sharps. We emphasize a realistic approach to historical fencing as a true martial art of self-defense, not a sport of scoring points or a staged entertainment. Ours is a killing art extracted and extrapolated from the many texts of historical masters-at-arms and Masters of Defence combined with hands-on experience with accurate weapons.